Key type will show "MSDN" instead of "Retail"
I'm sorry, but this is not true. MSDN keys show up as "Retail" in any PID Checker. Anyone is welcome to try that key in any PID Checker. It will show up as a retail key. I don't know why members are trying to pass MSDN keys are "Retail" keys but they are not. You have to check the "Edition-ID" on google and you will find out if they are from MSDN. OP washed out these numbers so he is hiding something, I can tell you 1 thing for sure: these are not retail bought key's legit from a real store. Watch out. Thanks for your feedback. Yeah, and the bummer is my trust (and the trust of others) got absolutely destroyed because of honesty. Everyone here is selling MSDN keys. 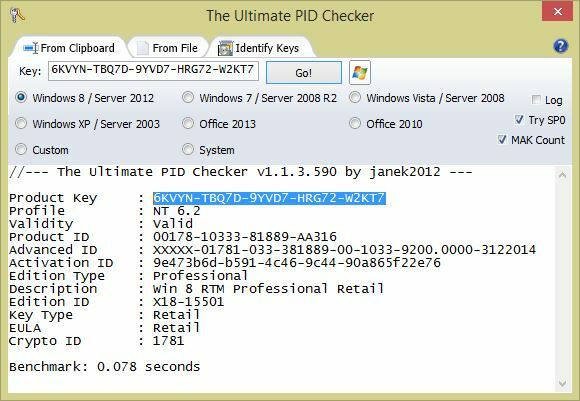 While it indeed looks like a regular key in PID Checker, it is NOT a retail key. Dreamspark is just like MSDN, except it is for students. If you want to verify what I'm saying is true, contact Microsoft and ask them about the key. THESE ARE NOT RETAIL KEYS. DO NOT BE DECEIVED. THEY ARE EXACTLY THE SAME AS EVERY OTHER KEY HERE. Where did you get that description ? Just contact Microsoft via their chat system and you will get this exact same description. You are responsible to provide accurate information about your keys, regardless of what your supplier said. You should have checked these keys on your own, first. Mark took care of me. I bought a number of keys from him and the ones I've tried so far have worked. I appreciate his professionalism and look forward to doing business with him again! I bought a Windows 7 Pro key off this seller, worked fine. Outstanding seller. Not thinking about money. All software are original with original key. Very cheap and affordable. I hope he will have more software in the near future. Thank you very much. You are saving us a lot of money, but cooperation are always thinking about their pockets. They don't care about people. They should give to people cheap prices with all the money they have. I need Windows 8.1 Pro key... how much I must pay? Thank you very much for your kind feedback ! Very good communication and quick response. Great seller. Pc is running 8.1 Pro now. Thank you.